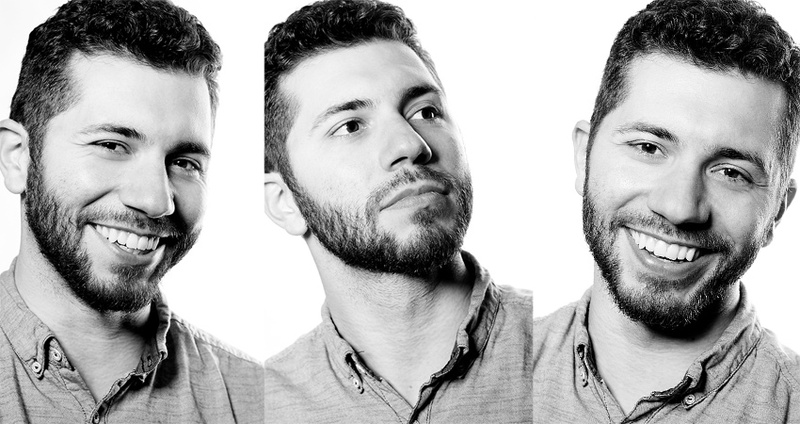 Gamut One Studios is proud to introduce Bryce Kalal, our newest team member. 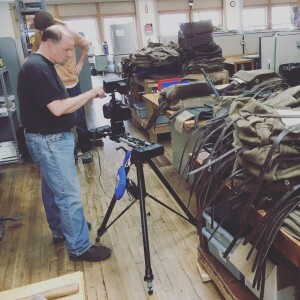 With our continued growth in video production, Bryce has taken on the role of video production assistant. 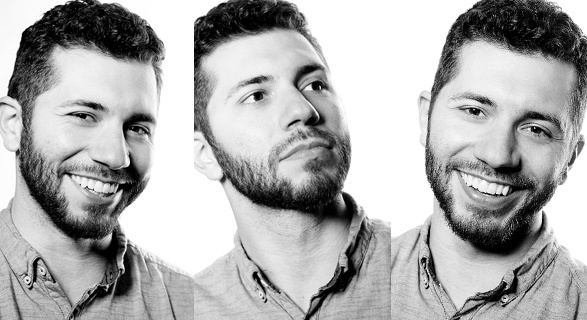 Bryce brings a unique set of experience to our team with creative writing, improv comedy and music production. We’ve already seen great work from him and appreciate all the positive feedback we’ve received from our clients since he started with us. Gamut One Studios – Meet Bryce from Gamut One on Vimeo. 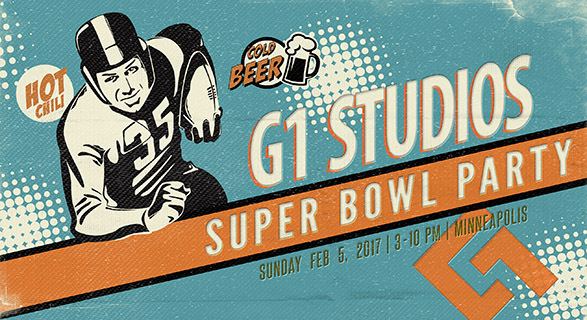 Football fans and fans of fun gathered Sunday, Feb. 7th at Gamut One Studios for our 6th Annual Super Bowl party blow out. With the game blasted up onto our 35’ cove ‘screen’, a plethora of spicy and savory chilis, hot-off-the-grill brats, ice cold beverages and a super cool kids’ party space—the party offered fun for everyone! The feel good time was about more than the pick up truck full of beer on our studio floor or the 9 varieties of chili — it was a night to help those in need. Once again Gamut One Studios selected a local charity to benefit from the night. 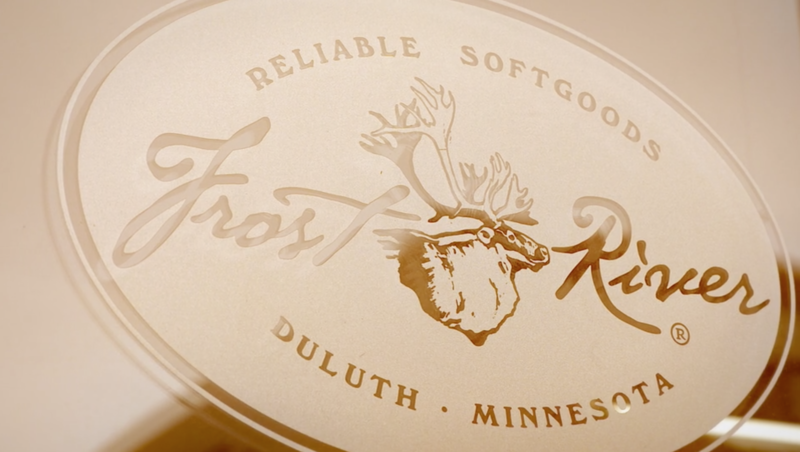 This year we supported The Greater Minneapolis Crisis Nursery, that works to end child abuse and neglect and create strong, healthy families. They support families in crisis 24 hours a day, 365 days a year through a free, voluntary service. Clients, friends and family generously donated items to create a stellar silent auction that along with donations, raised over $2,000 as well as a truck full of much needed nursery supplies! 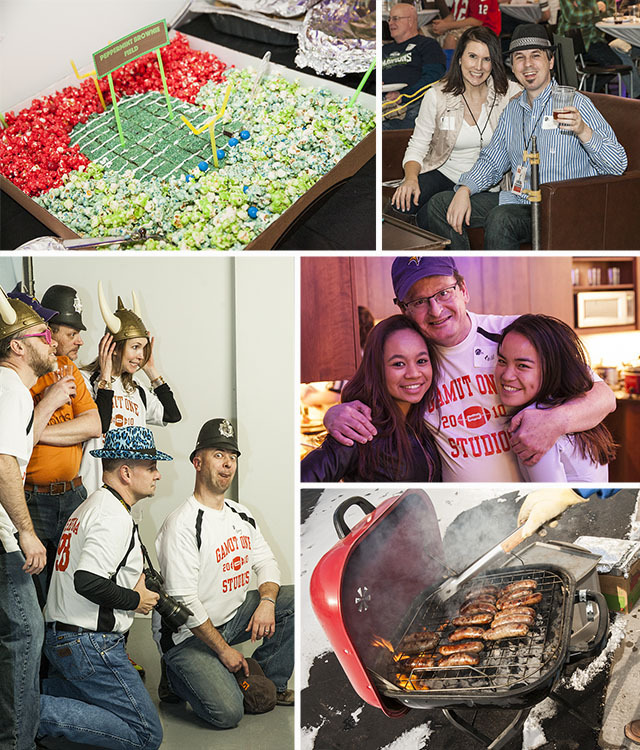 Of course, it wouldn’t be a Super Bowl party without Gamut One Studios’ famous Chili Cook Off! Greg Kamin’s Smoked Andouille Sausage and Beef Chili took top honors this year but whispers of the Imperial Pumpkin Chili and Chili Verde were heard to be close contenders. Some sweaty, sugared-up younger party-goers also raised the roof in Studio B with a giant bounce house accompanied by carnival games, prizes and candy galore. All in all, time enjoyed with family and friends while raising money for a good cause left both Bronco and Panther fans alike as the night’s big winners. 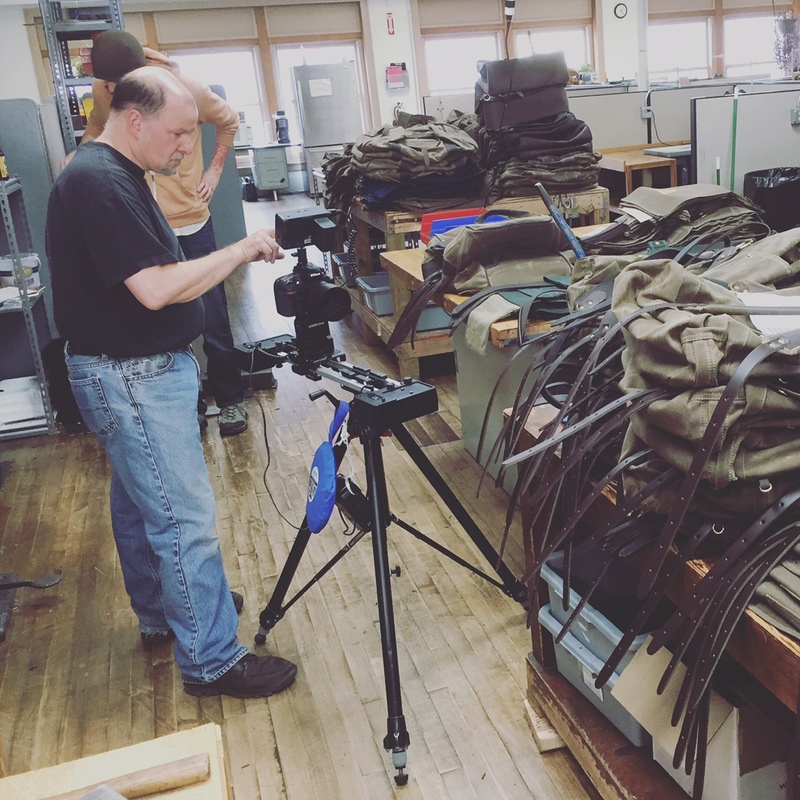 A special thank you to Myron Wolf and Cathy Monsoor who put in a ton of extra work to get the studio ready and prepping the food, which is always fantastic. 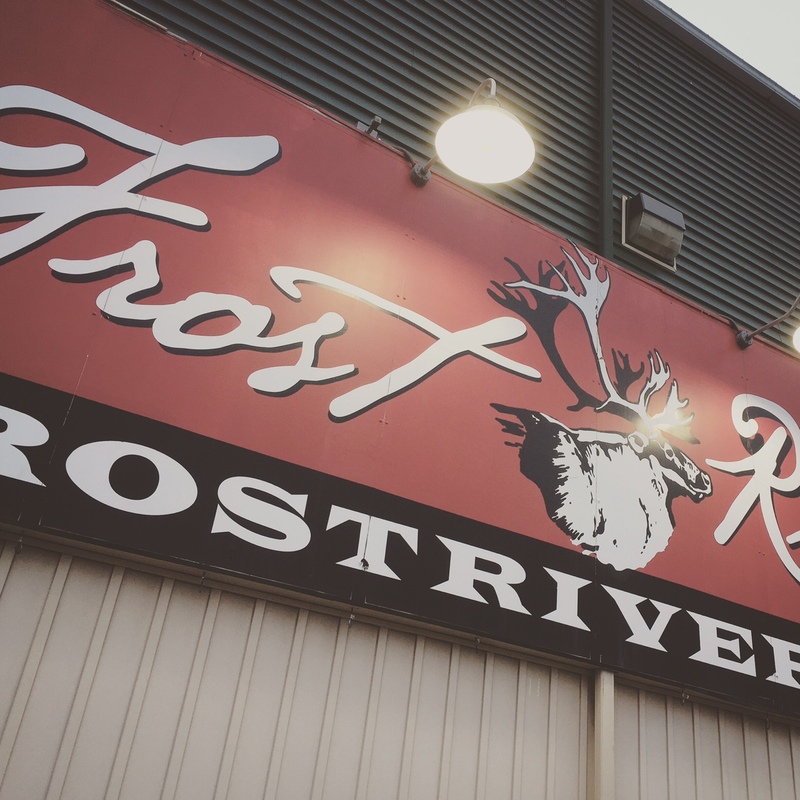 We also wish to thank our friends at Wild Wings, Zoom Works, Hunters Reserve, Frost River and Swedish Comfort for their generous donations that helped make our silent auction another great success! See your photos from the photo booth here. See all the photos from the party here. Just kidding! 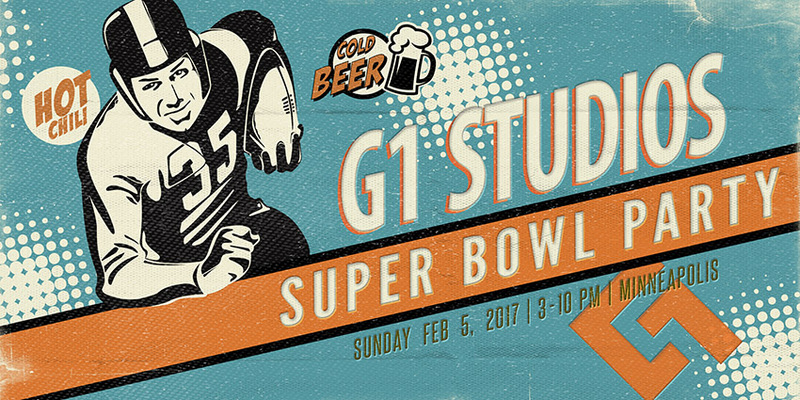 No, it’s not our 50th annual Super Bowl Party, but we will be celebrating Super Bowl 50 in grand style like we have the past five years. In spite of the Vikings failing once again to make a special appearance, we expect it to be a rip roaring good time. Of course we’ll have our famous chili cook-off and other great tailgating fare. The back studio will be loaded with fun stuff for the kids, including the bounce house. Don’t forget our always fun photo booth, games, and prizes. This year our silent auctions will be supporting the Greater Minneapolis Crisis Nursery, a great organization that works to end child abuse and neglect and create strong, healthy families. Anyone wishing to help us support this great cause is asked to bring an item or two for our door collection. Critical need items are baby food, diapers, wipes, and laundry detergent. You may (download) full donation wish list. *Please note they can only accept new items by law. 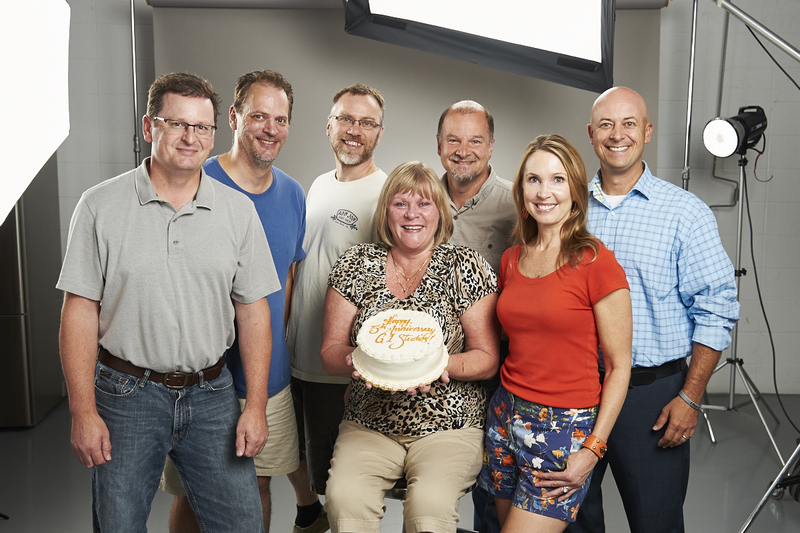 Gamut One Studio’s celebrates its 5th Anniversary today. 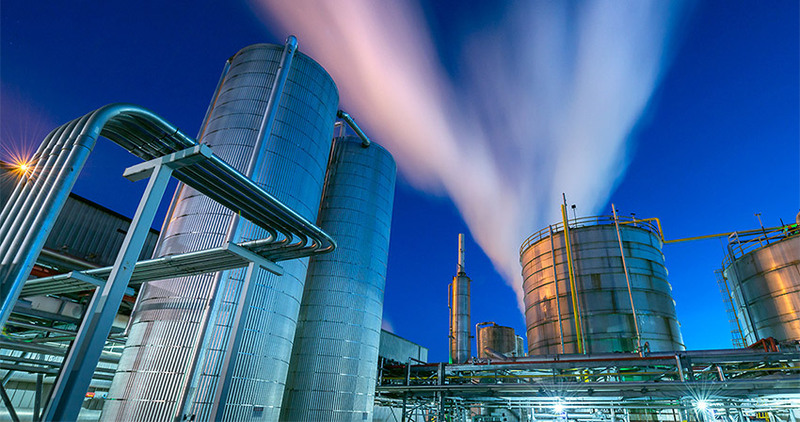 It’s been another great year full of fun, challenging projects and great clients to work with. 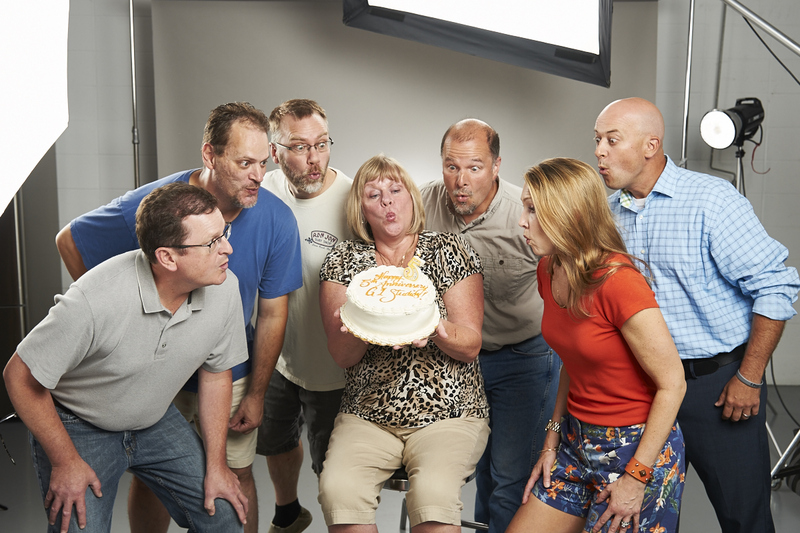 We just wanted to take a moment to enjoy a little cake and appreciate what a great crew we have to work with. Special thanks to our friends and clients who keep us constantly on the move and our families who put up with our constant motion. Here’s to another 5! 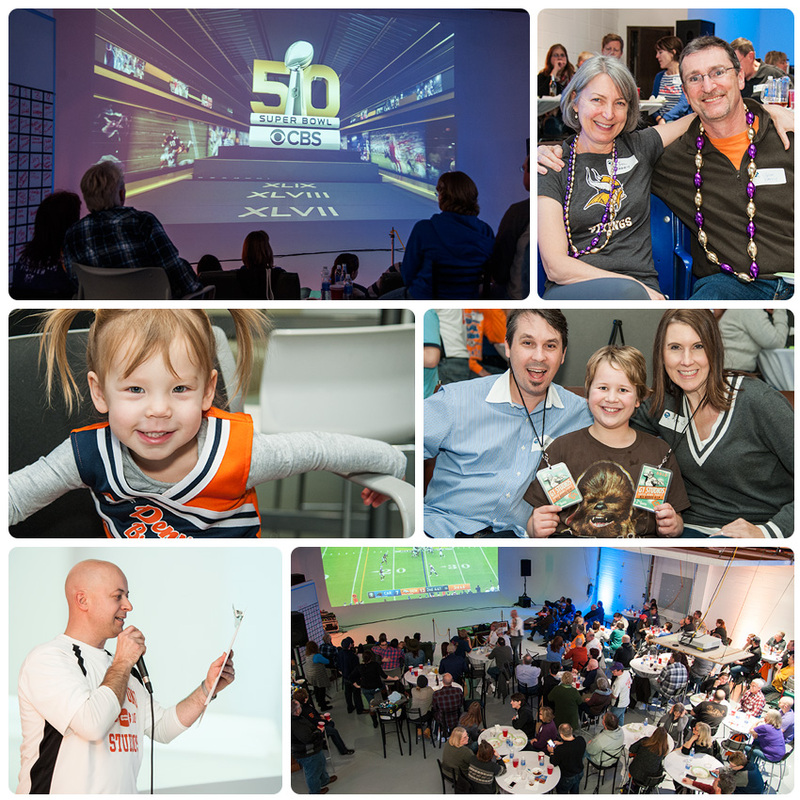 The 5th installment of our annual Super Bowl party was another great success. 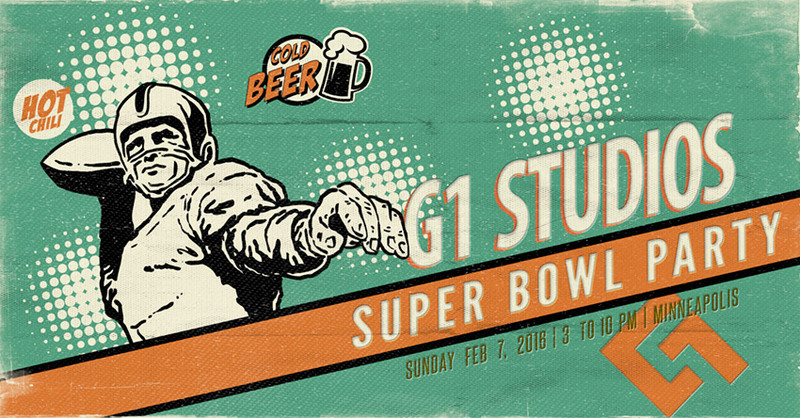 Guests stomped off the snow and shook away the cold as they flooded into Gamut One Studios on Super Bowl Sunday, greeted by the welcoming aromas of chili cooking and brats being grilled. Chili-gate? The Patriots and Seahawks put on a good show, but the contest of contention was to see who will wear the Chili Cook-Off Champion ring this year. Tensions were high and smack talk abound, to see if Greg Kamin could pull off a three-peat with his crockpot of goodness. Guests huddled and debated while carefully tasting each chili and anonymously voting Dewey’s White Chicken Chili to victory. Becky Schmieg received high accolades for her almost-too-pretty-to-eat Patriot and SeaHawk themed cookies. Barb Koshenina holds her rein as Queen of the Cookie, as she once again treated guests to her scrumptiously-addicting chocolate-chunk cookies. Diets were not on the invite list. Personal Foul! Shockingly, the most penalty flags were thrown during G1’s typically calm silent auction as the adorable Stuffies created bidding pandemonium! With just five cuddly stuffed animals to bid on and a disparate number of cute kids with their doting parents – begging and bribing was the name of the game. One super star mom finally plunked down an exceptionally generous bid to claim both victory and a peaceful drive home! Of course, the tears and cheers were all in good fun as the silent auction benefitted Gamut’s charity of choice this year, Soles4Souls, a global not-for-profit institution dedicated to fighting the devastating impact and perpetuation of poverty. Once again we were amazed by the generosity of our guests with the silent auction tables, VIP seating auctions, and cash donations, totaling close to $900. Not to mention, guests brought in pair after pair of new and gently used shoes to fill our lobby – 230 pairs in all!! Thank goodness the delicious smell of chili cooking subdued the foot locker ‘fragrance’! Many thanks to our friends and clients who donated their products and services for our silent auction. It is because of your help that we were able to raise the amount of funds we did. Thank you: Marketing Architects, Droolin’ Moose, Frost River, 3M, Wagner Spraytech, and Wild Wings. High fives everyone! 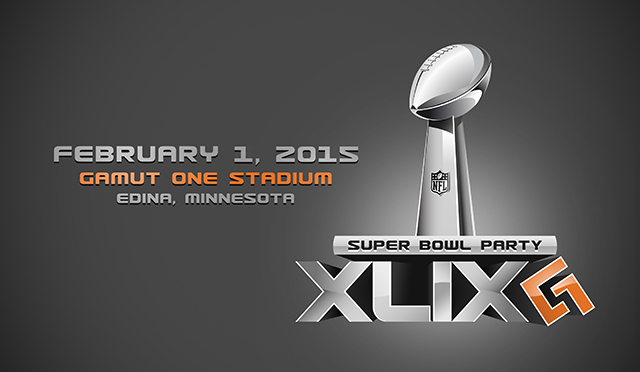 Super Bowl 49 is right around the corner and we hope you’ll join us again. Last year Mr. Manning and the Broncos failed to show up as the Seahawks sacked their way to an easy win. 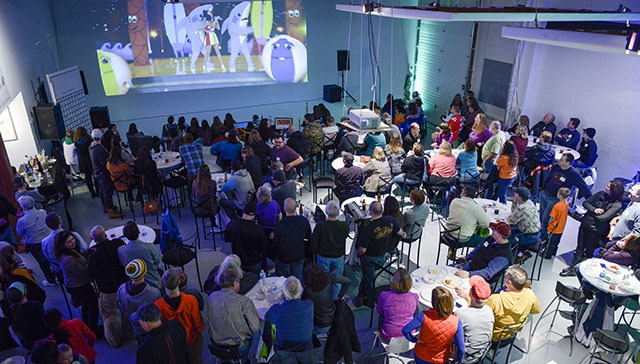 Our crowd at Gamut One Studios still had a fantastic time. 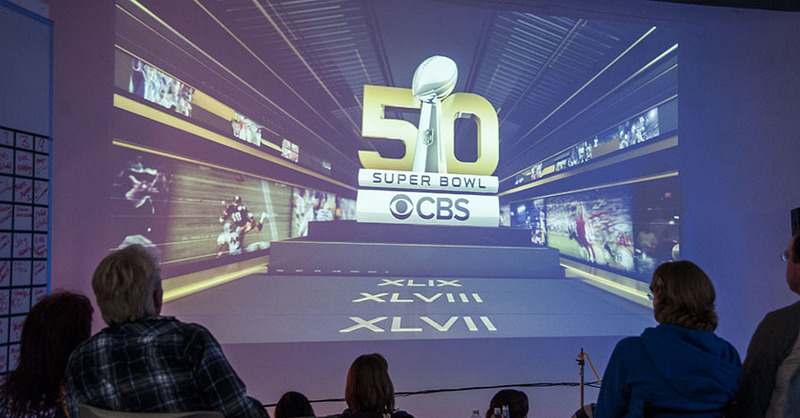 Again, we’ll have the big game projected in HD on our 35 ft. cove wall. 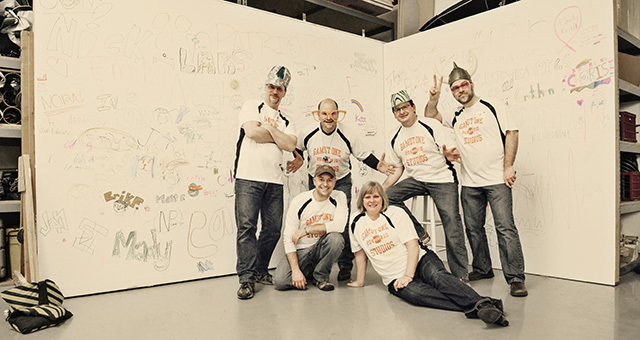 The back studio will be loaded with fun for the kids and of course, great food, beer and our famous chili cook-off. Greg was a repeat champion last year with his Poblano Peppers and Beef chili. The question now is can anyone knock him off? 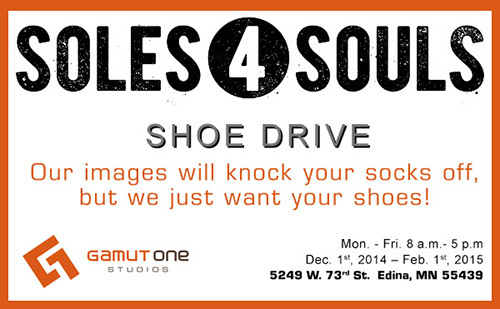 We hope everyone will help us support this year’s charity, Soles4Souls, by donating their gently used shoes. If your shoes are too stinky to donate, we’ll have some great silent auction items and raffles to help make a difference. Help our preparations with a RSVP on our party page. Doors open at 3pm. We look forward to seeing everyone again! 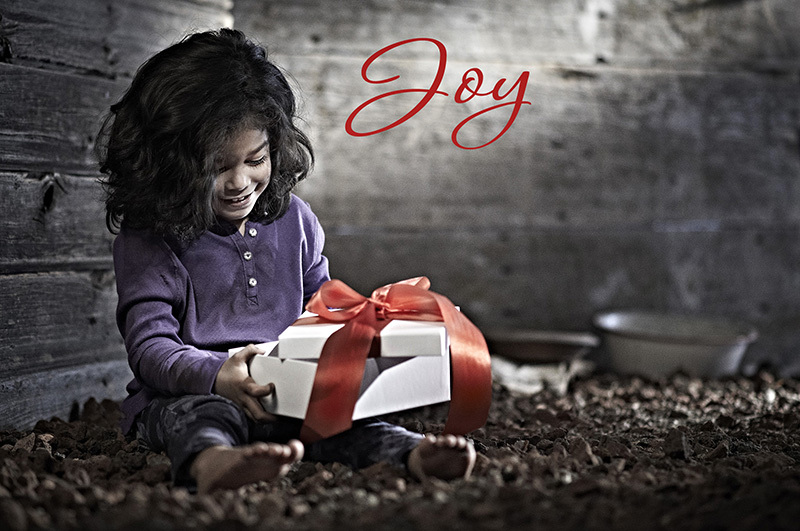 Each year Gamut One Studios chooses a charity to support and feature in our holiday card. The 2014 card was created by Greg Kamin to help raise awareness and donations for Soles4Souls. mission by collecting new and used shoes. The shoe drive will conclude on Feb. 1st, at our 5th annual Super Bowl Party. You will have the opportunity to join us for the party and drop off your donations. Don’t wait till then if you want to clean up your closets and drop off your donation during this season of giving. 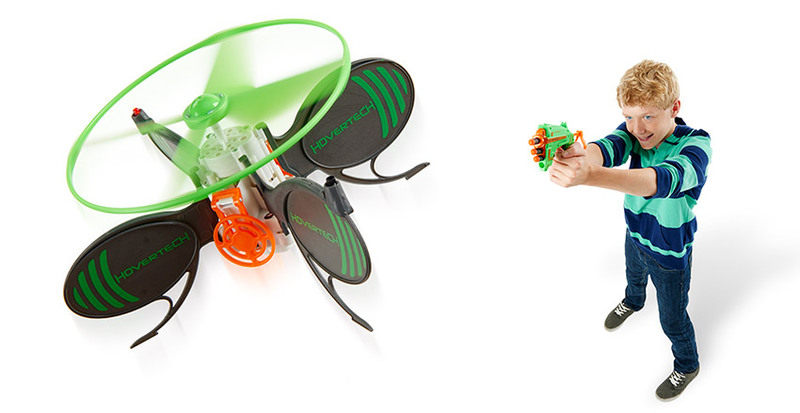 Adult and children sizes welcome. From all of us at Gamut One Studios, we wish you and your family a season filled with joy – Joy to share with all!